Just when you think you are on the cutting edge of marketing, new technology makes your current plan seem obsolete. You have hired professionals for paid social media optimization. You have changed your customer service interface to make it more friendly to millennials. You have created quality content surrounding your product or service to make sure you have an online presence. Now you need to know how your products can be marketed more effectively in the rise of visual searches. These aren’t the visual searches your mom just figured out how to do. When your mom looks for pictures of thanksgiving place settings she is doing an image search. An image search is a text-based search that results in an image. Visual searches usually allow the user to use an image to search for similar content. It can also refer to the technology enables users to interact with pictures presented to them online. This is done in a variety of ways. There are several search engines and apps that are the leaders in this market. Bing Visual Search allows you to interact with images that you pull up online to help you find particular products. If you are looking at a photo of a dining room table, and you are interested in purchasing plates similar to the one in the picture, you can zoom in on the part of the photo with the plate and find where it can be purchased online. Bing also allows you to use your own photos to shop. From your phone, you can snap a picture of a product at a store, and Bing will search the web for a similar product. There are non-commercial uses for this visual search as well. Find out the name of plants by taking a snapshot of it. Find out the name of a landmark or a piece of art by searching for an image of it online. Google Lens works similarly. Instead of pulling an image from your phone’s camera, the Google Lens app features a live viewfinder. Now a user can key in his search request, search for something with his voice, or use an image to find similar images online. Let’s say you are searching for a specific part for your broken dishwasher. You don’t know what the part is called, and you don’t know how to describe it. Using a visual search, you can take a photo of the piece and do a visual search for the part online. Not only is the part named, but you can also find a variety of websites that offer that part. Google Lens allows you to copy text from an image, search for similar products, identify plants and animals, discover books or scan barcodes or QR codes. Pinterest has been on the cutting edge of visual searches with their Pinterest Lens. This tool allows you to find similar images not only on Pinterest but on other websites as well. Pinterest’s “Lens Your Look” allows you to take a photo of a clothing item and figure out what to wear with it. It also allows you to take a picture of someone else’s outfit so Pinterest can search for similar items online. How to Prepare for This New Technology? 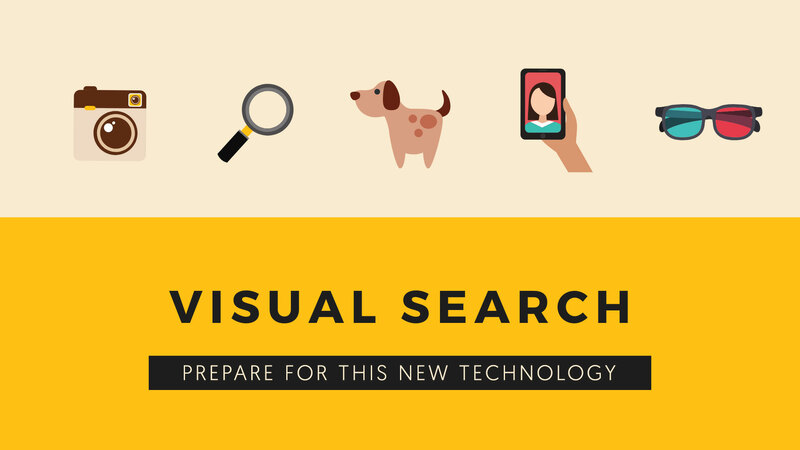 Marketing experts realize that visual searches are the trend, but many are not sure what to do with that information right now. They know that there are positive and negative aspects of this strategy. While it is good that customers can find your product easier, at the same time the customer will also see cheap imitation products that are available as well. Also, visual searches are just a tiny portion of the total online searches right now, but that “tiny portion” tops one billion monthly searches. Pinterest has seen their visual searches jump by 350 million searches in one year. While this technology is young, it is the growing trend. What do you need to do now to make sure you are ready to meet the demands of your customers? One thing you could do is to embed high-quality visual searches on your websites and apps. You also could be building image libraries to connect with your business, product, or service. As technology develops, more information will become available on how to best reach customers who choose to search for products in this manner.